As a female physician you’ve worked incredibly hard to be where you are today. Whether you own a thriving practice, or work in a large medical center or hospital, you’ve put in the hours, jumped the hurdles, met the challenges – in short, you’ve paid your dues. So why shouldn’t you be able to get more affordable rates for disability insurance? Long-term disability insurance is considered a priority for most physicians today. After all, you want to protect yourself financially if a serious injury or illness prevents you from working. The right disability coverage can let you do your job without worrying about what would happen to your income – and the financial well-being of your family – if an illness or injury kept you out of work for a long period of time. But if you’ve ever searched for disability insurance, you may have thought that the cost of coverage is expensive. This is due to the fact that many insurance carriers consider gender, as well as age, when they calculate risk factors. As a result, you may have felt that, for you, disability insurance was just not affordable. We believe every Texas physician should have access to disability insurance. So we’ve partnered with The Prudential Insurance Company of America to create the TMA Member Long-Term Disability Insurance Plan. In this plan, TMA members have access to group rates that are based on age, not gender, which means you can now get quality disability insurance protection at affordable rates. To see how affordable our group disability rates can be, we encourage you to contact a TMA Insurance Trust advisor. They can compare rates from traditional plans and The TMA Member Long-Term Disability Insurance Plan. You will see significant savings. They will also discuss the features of the plans and help you understand the differences. If you are in the earlier stages of your career, it can be especially advantageous to obtain The TMA Member Long-Term Disability Plan. This is a time when repaying student loans and starting a family can consume most of your financial resources. 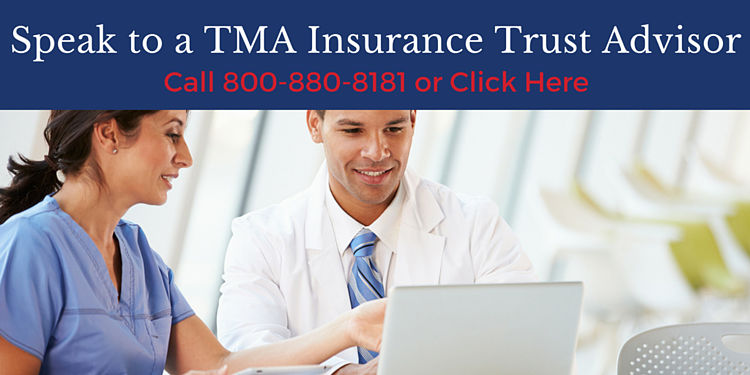 For a young, healthy female physician, the TMA member plan can lower your cost of disability insurance even further. Choosing a disability plan can involve many important decisions and individual considerations. So we invite you to consult free of charge with one of our knowledgeable advisors. TMA Insurance Trust advisors are not paid sales commissions – so you won’t feel any obligation or sales pressure. Their sole mission is to help you find the right plan that works for you. Don’t put off getting the affordable disability coverage you deserve. Call us at (800) 880-8181 or click on the link below. If you wish, you can apply for The TMA Member Long-Term Disability Plan issued by The Prudential Insurance Company of America at any time online. To get started, click here. TMA Member Long Term Disability Plan is issued by The Prudential Insurance Company of America, Newark, NJ. The Booklet-certificate contains all details, including any policy exclusions, limitations and restrictions, which may apply. CA COA# 1179, NAIC #68241. Contract Series 83500. Do Female Physicians Have To Pay More For Disability Insurance Than Male Physicians? Does Your Income Need More Protection? The Cost of Long-Term Disability: Are You Fully Aware of Your Risk?